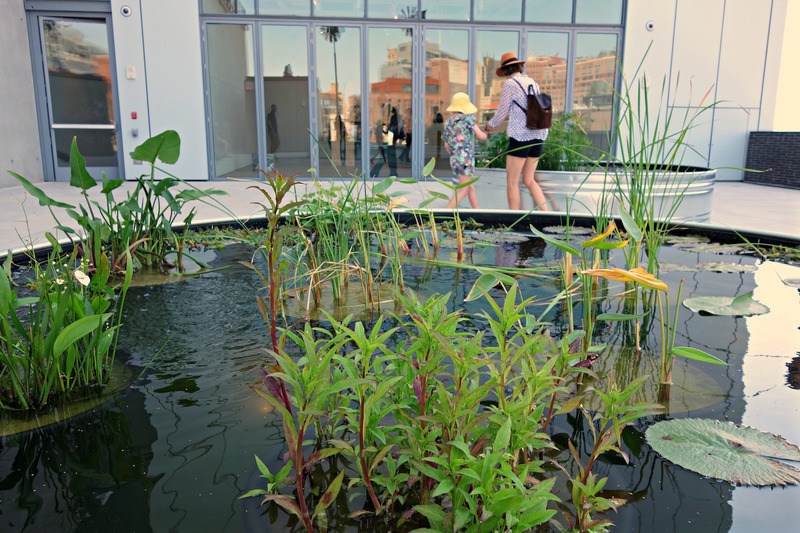 Three circular pools are flourishing with aquatic plants on the fifth-floor terrace of the Whitney Museum of American Art, part of Virginia Overton’s exhibition Sculpture Gardens. 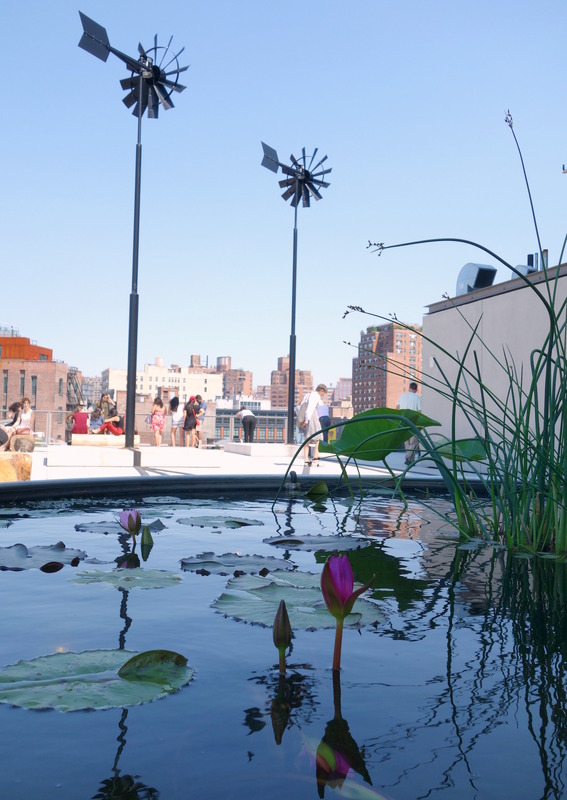 Two wind turbines aerate the water for the horsetail reeds, lily pads, elephant ears, bamboo, and other flora, while in two spaces inside, sculptures by the New York-based artist encourage different perspectives on the architecture of the building in Manhattan’s Meatpacking District. 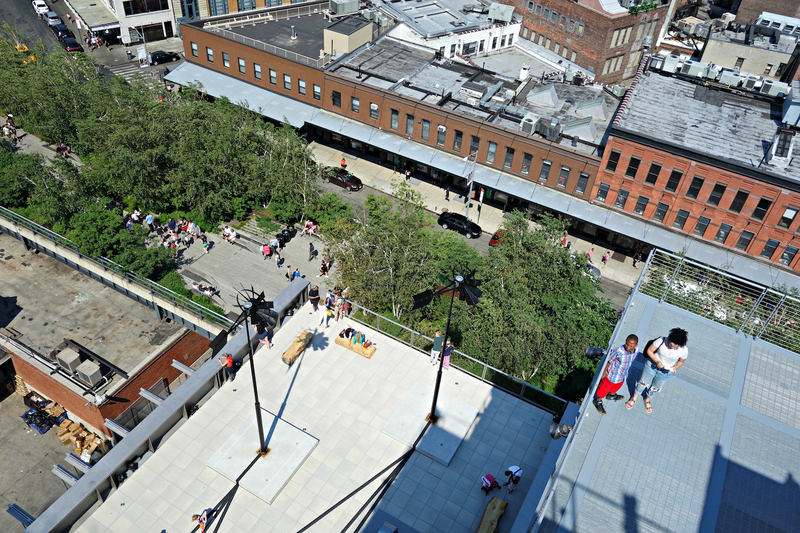 In terms of outdoor vistas, no other New York museum can rival the layered terraces of the Whitney’s new Renzo Piano-designed space, but the museum has yet to thoroughly experiment with them as more than soaring city vantage points or spectacular platforms for sculptures, such as the two-ton black star that punctuated last year’s Frank Stella retrospective. 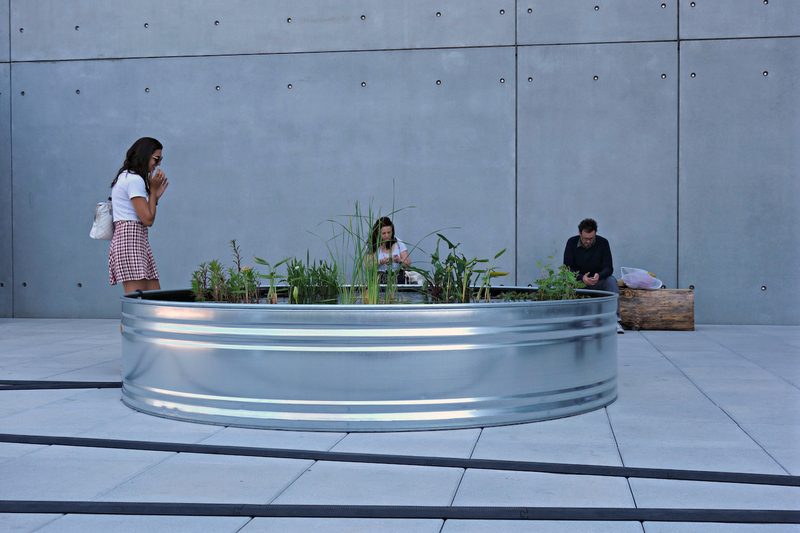 Organized by Chief Curator Scott Rothkopf and Assistant Curator Laura Phipps, Sculpture Gardens is a mix of gathering spaces — with its half-log wooden benches — and a “sculpture garden” connected by pneumatic tubes. 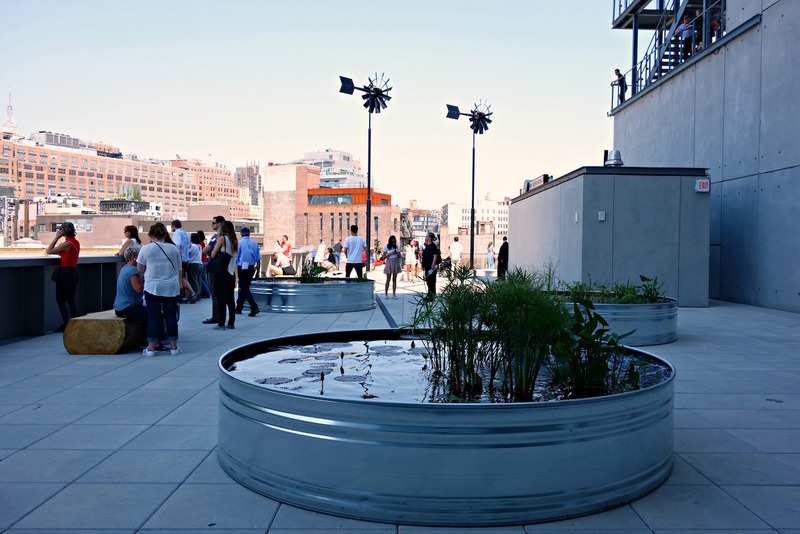 Its design was seemingly inspired by the recent architectural interest in green roofs, including the beehives on the Whitney’s own summit. 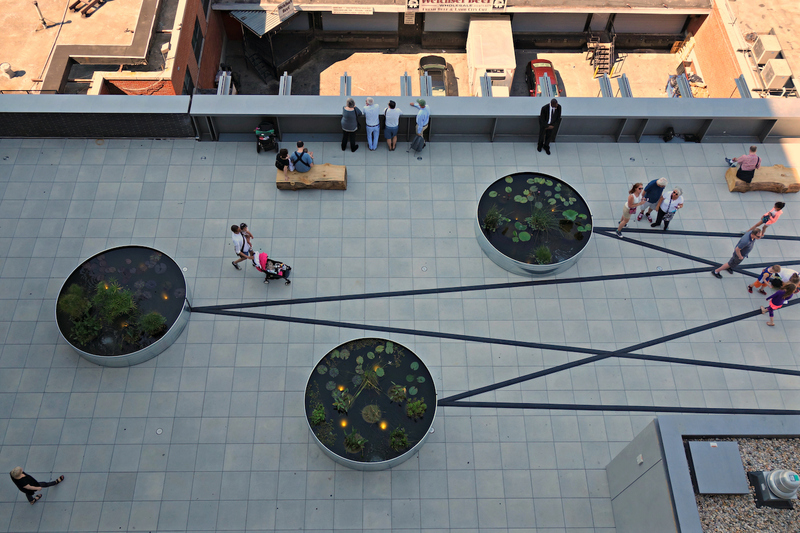 Looking down from Sculpture Gardens, the heavily manicured greenery on the High Line fades into buildings where there may be a few apartment plantings and private roof gardens with wavering trees, but on the whole not much cultivated roof space. 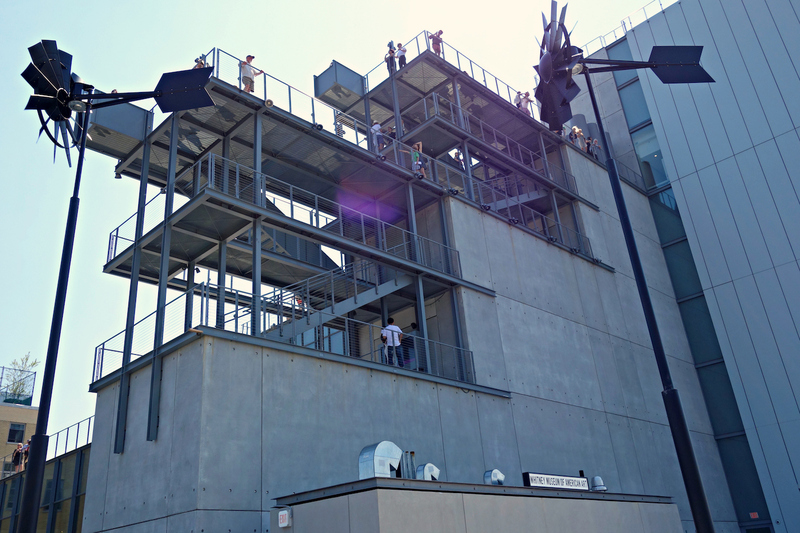 While a handful of new buildings incorporate small wind turbines for energy, there’s only one industrial-size turbine in the city — at Sims Municipal Recycling in Sunset Park, Brooklyn. 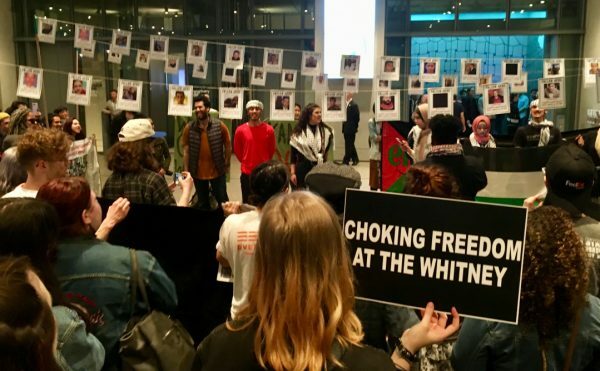 However, framing Overton’s installation purely as one of environmental design ignores that it’s very much about visitor perspectives framed by objects. 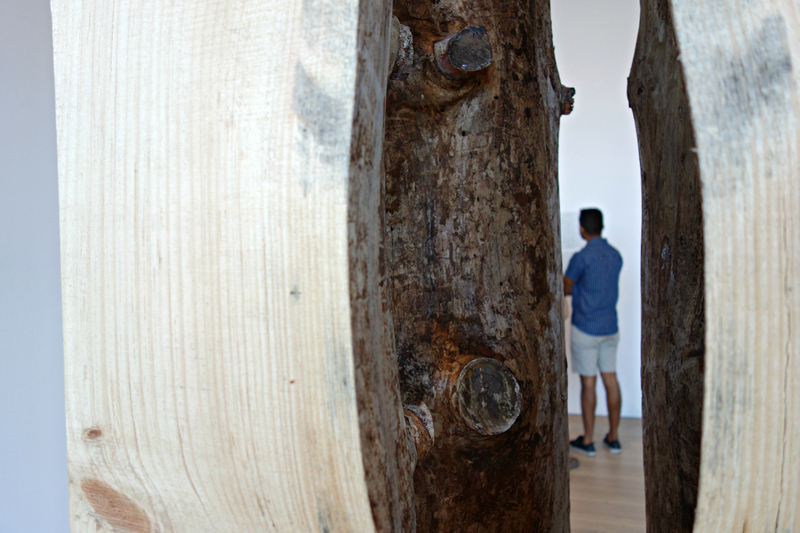 Inside, there are found assemblages, some from her family farm in Tennessee, like a dried ham hanging from the ceiling, a bundle of suspended metal rods, and the trunk of a pine tree quartered and sanded smooth — though you can look between the pieces and see the interior-facing sides, still rough with natural bark. 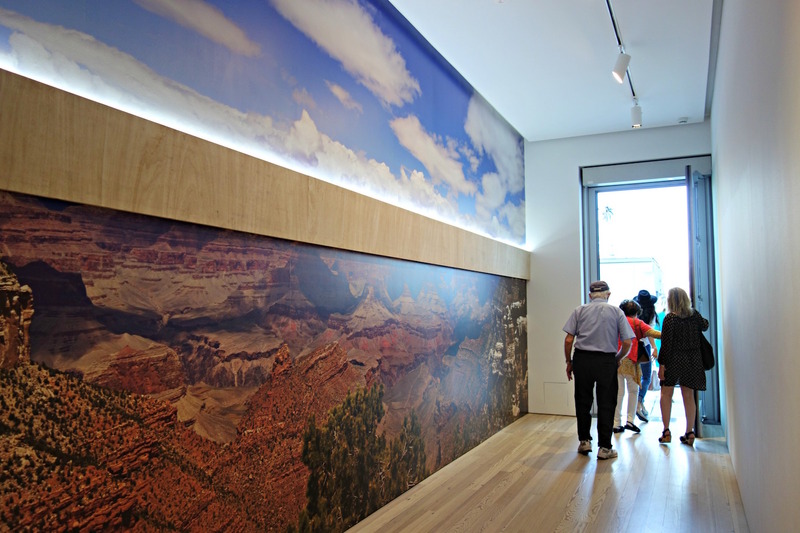 Each repositioning in the galleries to look at this work — whether the Kleenex box resting on a trunk decorated with the image of a waterfall, the sound of water coming from within, or the panoramic photo of a Southwestern landscape lining the hallway — encourages another view through the floor-to-ceiling windows out toward the metal ponds. 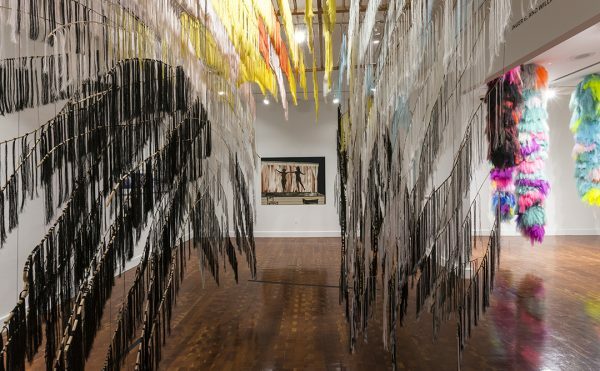 Some of these, like the hanging meat, are the kind of work that seems to coyly dare the viewer to ask “why is this in a museum?,” but others, like the sawed tree and the Kleenex soundscape, reinforce the collision between the natural and human-made. 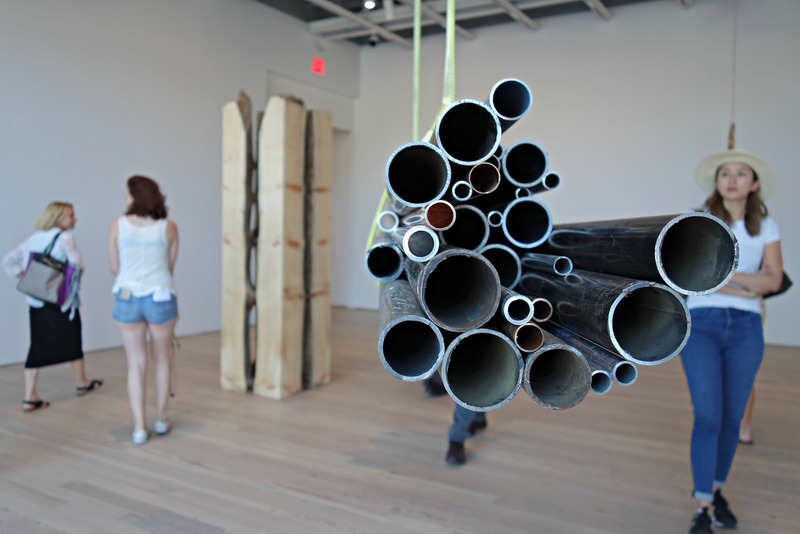 Overton isn’t an unknown artist, having created projects at the 2012 Frieze New York fair on Randall’s Island (where she suspended mirrors in trees) and 2014’s Storm King Art Center exhibition (where she connected brass tubes in a long fence that segmented the rolling grass). 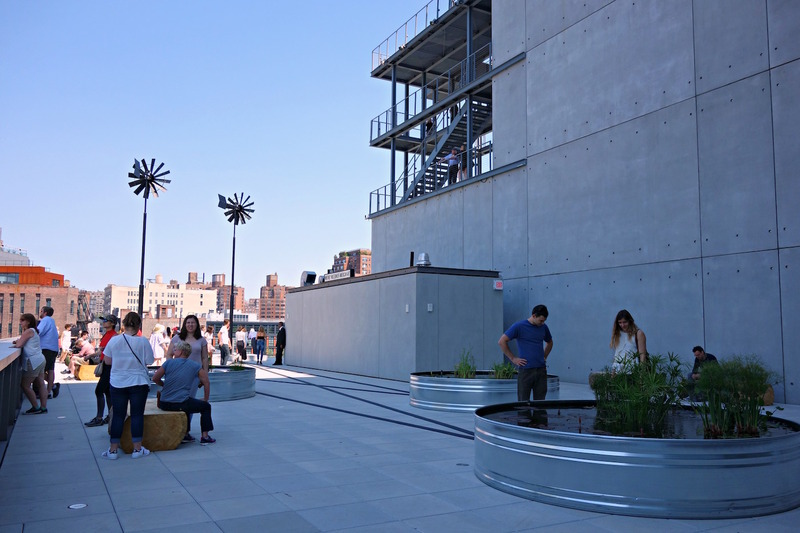 Still, it’s exciting to see the Whitney commissioning an artist without household name recognition to take over an outdoor space with an installation that considers ecological sustainability and the line at which a found object becomes art. 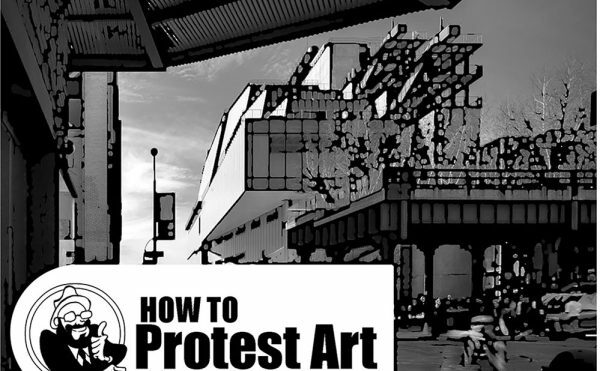 And, importantly, it reinforces the outdoor space as a place of visitor interaction, to linger and make connections both with the narrative of art in the museum, and the natural and built urban environment visible outside. 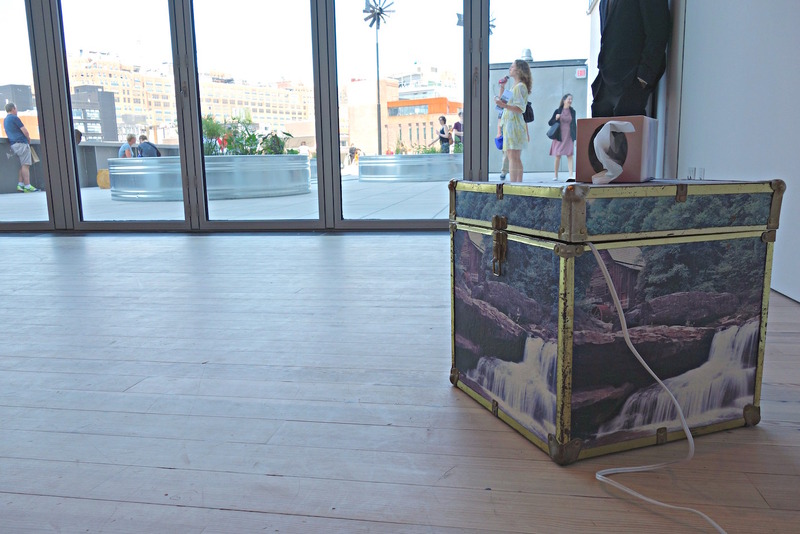 Virginia Overton: Sculpture Gardens continues through September 25 at the Whitney Museum of American Art (99 Gansevoort Street, Meatpacking District, Manhattan).